The first detailed map of the Grand Canyon. Geologic Map of the Souhtern Part of the Kaibab Plateau. / Geologic Map of the Southern Part of the Kaibab Plateau. / Geologic Map of the Grand Cañon in the Kaibab Plateau. / Geologic Map of the Southern part of the Kaibab Plateau - Head of the Grand Cañon. This map was engraved by Julius Bien and published in Washington D.C. in 1882. The separate panels here can be joined to form a single enormous map. Clarence Edward Dutton (May 15, 1841 – January 4, 1912) was an American geologist and Army officer. Dutton was born in Wallingford, Connecticut on May 15, 1841. He graduated from Yale College in 1860 and took postgraduate courses there until the outbreak of the American Civil War. In 1862, he enlisted in the 21st Connecticut Volunteer Infantry with which he saw action in Fredericksburg, Suffolk, Nashville and Petersburg. In1876, when the United States Geological Survey (U.S.G.S.) 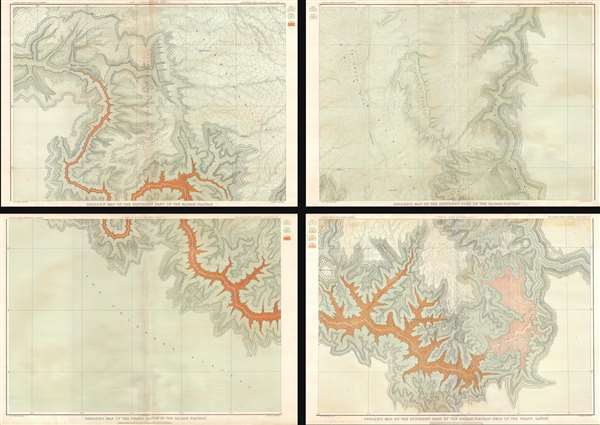 was created, Dutton began working in the Colorado Plateau where, through his close friendship with John Wesley Powell, G. D. Gilbert, and William Henry Holmes, produced the first detailed atlas of the Grand Canyon. He retired from the Geological Survey in 1891 and took a position as commander of the San Antonio Arsenal, Texas. He retired officially from the army in 1901, but continued to study Geology from his home in Englewood, New Jersey. The United States Geological Survey (1878 - Present), aka the U.S.G.S., is a scientific agency of the United States government, which was founded in 1879. USGS scientists study the landscape of the United States, its natural resources, and the natural hazards that threaten it. The organization has four major science disciplines: biology, geography, geology, and hydrology. It is a bureau of the United States Department of the Interior and is the department's only scientific agency. Dutton, C., Atlas To Accompany The Monograph On The Tertiary History Of The Grand Cañon District, (Washington) 1882. Good. Most sheets exhibit minor verso reinforcements. Upper left sheet has a centerfold reinforcement on verso. Measurement referrs to individual sheets, of which there are 4. Rumsey 4713.015, 4713.011, 4713.012, 4713.013, 4713.014.